The Mediterranean Diet Myth—Is It Really That Healthy? Roasted artichokes, spaghetti vongole, and bruschetta with prawns—doesn’t sound like a diet, right? In fact, the Mediterranean diet, also known as the Cretan Diet, is not about losing weight. Rather, it’s a nutritional model that’s rumored to have positive effects on your health in the short and long term. But is that really true? Let’s take a closer look at the much-discussed Mediterranean diet to find out what it’s all about. The Mediterranean diet: what is it actually? What is the Mediterranean diet exactly? Basically, it's a style of nutrition, not a diet for weight loss, as many people might assume. Mediterranean cuisine is based on a rich intake of vegetables, fruits, whole grains, legumes, and fish as well as a moderate consumption of nuts. Red meat, dairy products, and eggs are only consumed occasionally, while refined sugar and processed, white wheat flour should be avoided altogether. The main source of fat is olive oil. But does the seemingly simple Mediterranean diet really live up to its promises? There are several studies that focus on the influence of a Mediterranean diet on the cardiovascular system, blood pressure, and the development of various diseases such as type 2 diabetes mellitus, Alzheimer's and osteoporosis. These scientific papers date back to the 1950s. In the so-called "Seven Countries Study", 13,000 subjects were examined over a period of 15 years. The frequency of cardiovascular diseases and cancer condition for the seven countries was determined on this basis. The result was surprising: the inhabitants of the Greek island of Crete had the lowest rate of illness (hence the ‘Cretan diet’) and their life expectancy turned out to be much higher than for the other countries. The scientists involved attributed these results to the food culture of the Cretans, which at that time was characterized by an extremely high consumption of olive oil. This was the starting signal for further investigations, which focused on the mentioned olive oil in particular. Olive oil, often enjoyed raw (when it is at its most pure and healthiest), is the main source of fat in the Mediterranean cuisine, replacing other sources of fat such as butter and other frying fats. The main component of olive oil is oleic acid, a monounsaturated fatty acid. Numerous medical studies have shown that a high intake of this oleic acid has a positive effect on cholesterol and blood pressure. However, simply consuming high amounts of olive oil alone won’t do the trick. If you think that the mere intake of olive oil will naturally lower the cholesterol or high blood pressure now, I have to disappoint you. Above all, it is the interplay of the various dietary components in the Mediterranean diet—in addition to the essential, unsaturated fatty acids, including includes fiber, antioxidants, and phytochemicals. Dietary fiber, for example, is able to bind bile acids and thus lower cholesterol levels, put it simply. In addition, it has a stabilizing effect on the blood sugar level. Moreover, the Mediterranean diet is characterized by a high proportion of vitamin C and E from fruits and vegetables, which act as antioxidants and protect your body from harmful free radicals. What kind of food does the Mediterranean diet include? As already mentioned, plenty of fresh fruit and vegetables are served in the Mediterranean diet, as they are pleasantly filling and rich in fiber, vitamins, minerals, and phytochemicals. Legumes such as beans and lentils are another important source of fiber and protein and are consumed often. Contrary to most expectations, bread, pasta, and pizza are allowed but you should choose whole grain products over more refined white flour products here. Red meat is restricted in the Mediterranean diet, as it was traditionally an expensive indulgence, while fish and seafood should end up on the plate at least twice a week as they are an important source of essential omega-3 fatty acids. Eggs and dairy products such as yogurt and cheese are allowed in moderate consumption, while sweets and refined sugars should be avoided. Instead of table salt, more herbs and Mediterranean spices feature in dishes. Nuts and seeds are also allowed in small portions because though they are high in calories, they are a rich source of valuable, healthy fats. Olive oil is the most important source of fat in the Mediterranean diet. As we already learned, its main ingredient is oleic acid, an essential, monounsaturated fatty acid. But that does not mean that you should have a huge plate of whole-grain pasta swamped with olive oil every day. It’s the balanced combination of all these foods that makes the Mediterranean cuisine that valuable. Conclusion: Is the Mediterranean diet healthy or not? In one of the most extensive intervention studies to date—the so-called PREDIMED (PREvención con DIeta MEDiterránea)—the effect of a Mediterranean diet on cardiovascular health was investigated in about 7,000 participants. This medical trial was able to show a significant reduction in the risk of cardiovascular disease by about 30 %. So, you only need to eat Mediterranean food to stay healthy? Unfortunately, it’s not that simple. In a nutshell: the Mediterranean diet cannot be declared healthy without exception. However, compared to the average modern-day Western diet, which often is low in fiber and high in fat and meat in general, it offers some essential nutritional benefits. At this point, it should be noted that not all studies on the Mediterranean diet could meet the strict scientific criteria and sometimes, they appear to be contradictory. Thus, results and the quality of the examinations can vary greatly, which can be attributed, to a non-representative number of subjects, for example. 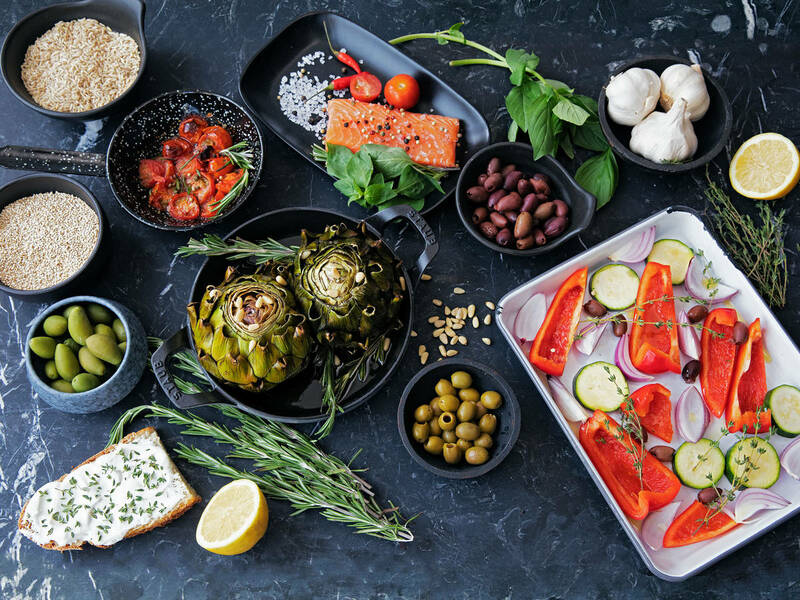 Although there are still some open questions left, many experts consider the traditional Mediterranean diet to be advisable. Thus, the positive influence on the blood lipid levels and blood pressure—and therefor also on the cardiovascular system and the vessels—can be considered proven, according to current studies. The influence on the risk of type 2 diabetes mellitus as well as on inflammatory diseases such as rheumatism or osteoporosis are currently being discussed. She’s considered the queen of the Mediterranean diet—we’re talking about no less than the infamous artichoke. In Mediterranean countries, artichokes are mainstays at any food market and they are also gaining more and more fans in other parts of the world. It’s hardly surprising because the green queen is not only a visual highlight but is also rich in fiber and phytochemicals. Clams are the centerpiece of this Mediterranean classic. Here they not only provide flavor and texture, but also contain valuable fatty acids—just another perk of this so-called ‘diet’. You can hardly speak of Mediterranean cuisine without mentioning eggplant. The purple Mediterranean veg is high in fat-soluble fiber which bind to harmful cholesterol in the blood. Since they are great sponges for flavor, they can be prepared with herbs and spices and are wonderfully versatile. Want to try something now? Our vegetarian version of the popular involtini will knock your socks off. Sea bream is the perfect choice if you’re looking for a Mediterranean fish dish. Saltwater fish like sea bream are known to contain high levels of valuable omega-3 fatty acids and should therefore feature regularly on your menu. A delicious representative of the Mediterranean diet and perfect for hot days: this gazpacho is made of a fantastic combination of cantaloupe, tomatoes, cucumber, red bell pepper, basil, and garlic. Thanks to the fresh ingredients it satisfies the palate and refreshes you all at the same time. A vegetarian recipe that proves that the Mediterranean diet is not only healthy, but also incredibly rich in different flavors. Fresh vegetables, including cauliflower, zucchini, leeks, and peppers are seared and served with a spicy Romesco sauce made of roasted peppers, garlic, almonds, and olive oil. A popular Mediterranean starter, made from tender and lean veal, topped with a full-bodied sauce of tuna, anchovies, and capers. This culinary delicacy from Italy has long since become an antipasti classic. Caponata is a kind of Mediterranean stir-fry made of eggplants, tomatoes, basil, garlic, green olives, and pine nuts soaked in a punchy vinaigrette. The traditional Mediterranean dish has always delighted the taste buds throughout Italy and beyond. Bruschetta is the classic Mediterranean starter. It never gets old: whether you like it more traditional with tomatoes, garlic, and olive oil, or in a sweet form with pears, honey, and goat cheese, or head to the sea with the addition of prawns as per this recipe—the small appetizers are always a great treat. If you're a fan of seafood, this Mediterranean recipe is perfect for you! The mix of shrimp, squid, and mussels provides you with essential fatty acids, iodine and high-quality, easily digestible protein. It’s also a great dinner party centerpiece. What do you think of the Mediterranean diet? Would you integrate the ethos of Mediterranean cuisine into your daily routine or are you skeptical? Let us know in the comments below!